started at an early age. Her lifelong interest in drawing and painting was sparked when as a student in the 7th grade in Manila, she won first prize in a national art competition with a watercolour rendering of a typical Philippine village. Learning of her artistic gift, her parents would ensure that she would always be engaged in some artistic activity. She has maintained her interest in art through many years in the numerous places where she has lived and worked as an administrative assistant in diverse industries, e.g. Sydney (Australia), San Francisco (California), Calgary (Alberta), and since the mid 80's in Waterloo (Ontario, Canada). Her avocation in watercolours has helped her develop her talents in other artistic areas, such as calligraphy, rubber stamp art, and web page design. She loves to devote her weekends to painting aquarelles of themes derived from the diverse places she has lived. 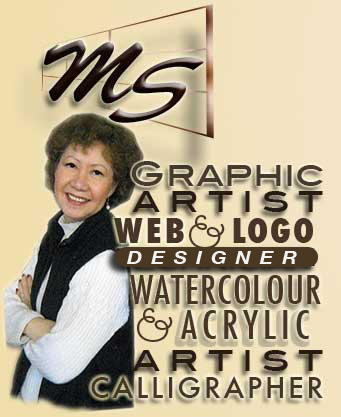 Mitzi Schnabel accepts commissioned work, be it large or small, in both acrylic and watercolour painting, in calligraphy, and in web site design. Her other interests include genealogy and family tree illustration.